Interpreting the Will of God gives Christians the necessary tools to look beyond the secular distractions that compete for our attention and to focus on the Lord's plan for us. Dr. Mack King Carter explores the nature and characteristics of God and uses his spiritual insights to provide readers with keys for knowing God's plan for their lives and having the confidence to accept his divine will. Carter adeptly relates biblical principles to the lives of people in the pews, but he goes beyond familiar biblical teachings to consider how Christians can discern God's will through experiences of suffering, failure, and rejection, through patience, faith, and fellowship with God, through discussion with other believers, and through good, old-fashioned common sense. Practical in its orientation and in its down-to-earth guidance, Interpreting the Will of God tackles head-on what is arguably the greatest challenge and most fundamental goal of Christian living. 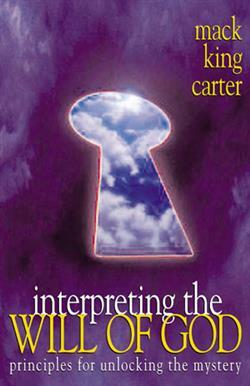 Dr. Mack King Carter, MDiv, DMin (1947-2013), was a noted preacher, teacher, author, and lecturer. Considered one of America's great African American pulpiteers, he travels throughout the United States and abroad preaching, teaching and lecturing. His classes at the National Baptist Convention Congress of Christian Education are packed to capacity with preachers and lay persons who come each year to hear one of God's master teachers. Noted for his biblical scholarship, his exegetical expertise and masterful skill in homiletics and hermeneutics, he is considered a "preacher's preacher." Prior to accepting the call to pastor the New Mount Olive Baptist Church, Dr. Carter served Calvary, Watula and St. John Baptist Churches in Ocala, Florida and Green Castle Baptist Church in Prospect, Kentucky. Dr. Carter retired from New Mt. Olive Baptist Church in 2009. He is the author of four books including A Catechism for Baptists, To Calvary and Beyond, A Quest for Freedom and the Judson Press book, Interpreting the Will of God.